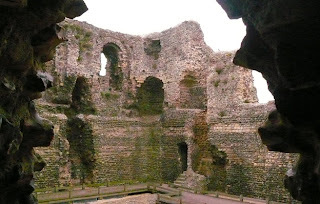 These are the remains of Canterbury Castle. Although it was built for warfare with very thick stone walls, Canterbury Castle was never put to the test. It was mainly used as a prision. There is not much information available about Canterbury Castle but we know that between 1555-57 the castle used to hold 52 innocent martyrs who are imprisioned for their religion and later burnt at the stake. I find it hard to imagine such a lovely ruin as a prison. I agree with Your EG Tour Guide's comment. Just now I've enjoyed browsing through your recent posts. About the fully cooked sausage, it's pork sausage with all that entails--the main difference is that I don't have to start with it raw. For me this means less popping grease, less having to stand over it, so I have more time for the rest of the breakfast goodies. That's an amazing ruin, Rose. Lovely pic. People sure did build solid structures back then. I wonder how many of our new modern marvels of architecture will be standing in a condition even close to this 400 years from now. I'd venture to guess few, if any. In the USA we will tear them all down build new about 10 times in that period of time. Waste! Thanks for posting, Rose. Adoro estes locais e as suas histórias. São pedaços da nossa história como seres humanos. I love the way you framed this, Rose. You've taken a beautiful subject and made it your own by framing it your way. Very nicely done.